Former De La Salle High School head football coach Bob Ladouceur won 399 career games in his 34-year career — including 151 in a row. 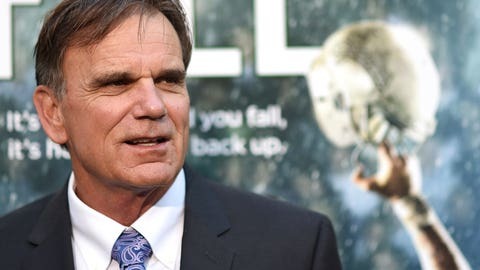 Bob Ladouceur was the football coach at De La Salle High School in Concord, Calif., for 34 seasons before he stepped down last year. He stopped talking to the media with any regularity many years before that, though, which makes sense when you consider he won 399 games over his career. And then there’s The Streak. You ever think athletes and coaches sound like they’re saying the same thing over and over after five or maybe 10 wins in a row? Try 151 games without losing. That’s 12 years. You’d feel like you were repeating yourself, too. But Ladouceur — portrayed by actor Jim Caviezel in the movie When the Game Stands Tall, which opened last weekend in theaters around the country — maintains that his eschewing attention has little to do with some innate disdain for repetition and is more that he just never really had the time to say anything anyone would want to hear. He was far too busy being a coach and teacher — Ladouceur still teaches health and physical education at the school — and being out of the spotlight was always his preference. So to see a large-scale Hollywood picture made about his team’s handling of both success and personal tragedy is anathema to what Ladouceur has preached throughout his time in athletics and academia, but he says the final product sends the right message to movie-goers, so he’s happy. "As a guy who didn’t really want the spotlight, and didn’t want a lot of attention on himself or the program, this is the total antithesis of that," Ladouceur told FOXSports.com by phone last week from his office at De La Salle. "I’m just glad that the movie, in terms of message, tells what we did. If people come away with it thinking, ‘Well, this guy did some different things that were really cool,’ or "I never thought of doing that,’ if they can come away with that, then I’ll be happy because that’s how we were." I asked him if he ever had the chance, while he was coaching, to just sit back and appreciate the streak for just how unlikely it was — the previous national record was 72 straight wins — or if that recognition has only come in stepping away from the program, which he did in early 2013. "I never really thought about it at the time, and even after we lost and moved on to a new season, I never really gave it a second thought. I didn’t think about it," he said. "Now, when I retired, I gave my career some thought. I look back on that streak now and I go, ‘Oh my God, that’s going to be really difficult to break.’ You got to have a little luck. We sneaked through on a few games and won when we shouldn’t have, but for the most part, they earned it, and the kids here worked their tails off and believed in it and what we were doing. It carried its own momentum." And De La Salle didn’t compile such gaudy numbers on Ladouceur’s watch because it was playing lesser-skilled opponents every week. It played the best and beat the best, and people noticed. "Considering the fact that De La Salle has played the best competition and has sustained their undefeated record," late coaching great Bill Walsh once said, "their accomplishments are truly amazing." By 1978, Ladouceur had worked for one year as an assistant at Monte Vista High School in Danville, coaching running backs and defensive backs. All the while, he was working a weekend shift at a local juvenile hall to help pay the bills. "I just did [coaching] for fun, and I really liked it," he recalls. But when California voters that year passed Prop 13, which strictly regimented (read: slashed) the amount of property taxes people had to pay, the juvenile hall cut its budget in half and that meant Ladouceur would soon be out of a job. He saw an ad in the local diocese newspaper about a school named De La Salle that was looking for a football coach and teacher. "So I figured I’d apply, but I never thought I’d get the job. I thought, ‘What the heck?’ " Ladouceur said. "They hired me, but they didn’t have any expectations. Football was an afterthought, and they wanted a teacher first, which I liked. They never had a winning season." Ladouceur went 6-3 that first season and won his first state title by 1985. Sixteen more would follow. "I had a great background in football," he says. "I had great coaches, and they taught the game well and they taught fundamentals, and I understood it all. I was not really trying to be, but I guess, through osmosis, was a pretty good student of the game. I felt confident that I could go in there and teach a lot of facets of football in multiple positions. I didn’t know about how to handle a team, or how to handle kids that age that well." Especially early on, Ladouceur figured the relatively low age gap between him and his players could be viewed (and used) as an asset. "I do think, in a lot of ways, I was like their older brother, but I didn’t treat them that way," he said. "Maybe like the older brother that beat ’em up or something like that. I was tough on them. I wanted to take them as far as they would let me, and I had a good idea of who could do better and who could try harder. I always try to push kids to their ceiling as they stood at that age in that time and place." Of course, with high school kids always comes the extracurricular, and it’s mostly concerning these added responsibilities and concerns that Ladouceur spent his free time, insofar as he ever considered that he had any. "I always placed the huge value in our program in how our kids treat each other, what kind of students they are. Are they learning things under our care? I was more focused on all those things," Ladouceur said. "I was totally consumed in the day-to-day operation of the program all the time. When you’re dealing with high school kids, then there’s the off-field stuff or classroom stuff that pops up every single day: A guy walked out of a classroom. A guy was disrespectful to a teacher. He cut class, or he’s not showing up to school on time. Just something that always kept popping up. We were always putting out fires and dealing one-on-one with kids. "That’s just the nature of high school. I think a lot of coaches sometimes let that stuff go. They don’t want to be bothered with it. But we didn’t. We were totally on that stuff. If you’re going to do it, you got to do it all the way. And if you’re going to do it all the way, it’s time-consuming." And even as The Streak brought national attention to his De La Salle for the first time, dealing with reporters who were constantly harping on that singular angle was never all that enjoyable for the coach. "Every article that was ever written about our team, after we broke the national record, started out with the win streak: ‘De La Salle will be attempting to win its 96th game in a row this Friday night,’ " he said, no bitterness in his voice. "And after the game: ‘De La Salle won its 97th game in a row Friday night.’ It was always a reminder and always a precursor." As Ladouceur sees it: "I didn’t really intentionally dodge the media. I never really broke my neck trying to get to them, either." And now, Ladouceur, who stepped away before last season, never really has to talk to another reporter again. But even in his retirement, he hasn’t run off to some remote island hideaway with his wife, Bev, or even left the state. Instead, he’s now an assistant coach for De La Salle, working with whatever head coach Justin Alumbaugh (who went 14-1 in his first season) wants him to do, and he couldn’t be happier. "Last year, I felt that initial loss of purpose, but I feel good about it. I’m working more one-on-one with kids. I don’t make a whole lot of decisions. If I want to miss a practice, I miss it. I’m now one of those coaches that goes from the field to his car, not back to the coaches’ office, and that’s kind of nice," Ladouceur said. "I’ve got a lot more time, not to worry so much about what we’re going to do tomorrow. I can pop in 10 minutes before practice, get the game plan, and I can pull it off." Last year, I felt that initial loss of purpose, but I feel good about it. I’m working more one-on-one with kids. I don’t make a whole lot of decisions. If I want to miss a practice, I miss it. I’m now one of those coaches that goes from the field to his car, not back to the coaches’ office, and that’s kind of nice. And even seeing himself portrayed on the big screen, Ladouceur, still only 60 years old and sitting on 399 career wins, doesn’t envision ever grabbing the clipboard for a chance at a very cool and round number. "I did it long enough," he said. "I’m totally satisfied. I had my thrills and my relationships with the kids. "I filled up my scrapbook, so to speak." His zero-game win streak intact, you can follow Erik Malinowski on Twitter at @erikmal and email him at erik.malinowski@fox.com.